A few months ago, I travelled to Canada for a two week holiday. Of course, before I went I checked out what nice concerts would be taking place while I was there that I could go to. It turned out to be during the same period when Kamelot were scheduled to play there, supported by Delain and Battle Beast. What a nice line-up I thought, one that also afforded me the opportunity to see Kamelot showcasing their latest record, 'The Shadow Theory', which came out only a few weeks before. 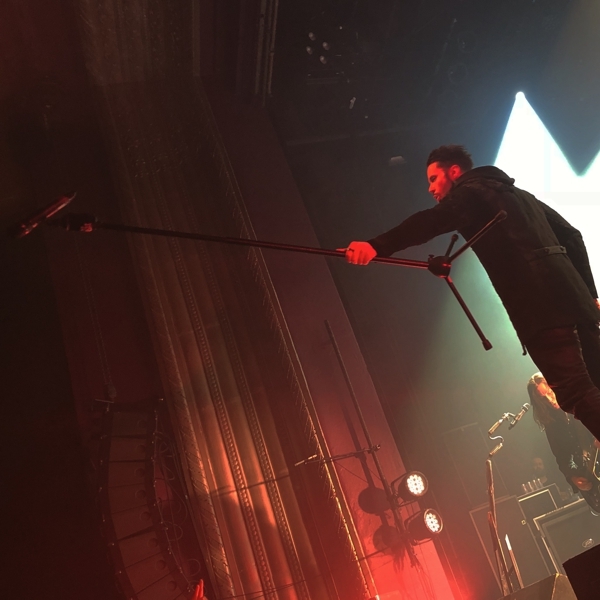 I attended both shows in Montréal and Toronto, and here's my personal thoughts about the one in Quebec province. The gig took place in MTELUS (ex-Metropolis) which is a very nice, big and recently renovated venue in the city centre of Montréal. It was pretty crowded and that was not surprising given the quality of the three acts who were playing that night! Finland's Battle Beast opened the set with the explosive Noora Louhimo killing it! They played eight songs, almost all from their last album 'Bringer Of Pain'. It was the first time I had seen them live but it will definitely not the last. They played very intense, typical Heavy Metal and managed to turn the audience on fire in only thirty minutes – everybody dived into it. The energy on stage could be seen and was much appreciated. Right up to and including the last song 'Beyond The Burning Skies', Louhimo gave everything as she jumped and screamed, while the audience participation was very intensive... they certainly wanted more! Twenty minutes later, Delain arrived on stage. I will admit I journeyed all the way from France to see them again as I never get tired of their music and their happiness on stage; I have never been disappointed. The stage was set up in a very pleasing and unconventional way with a very nice canvas and backdrop, and it was the first official tour for their new drummer Joey de Boer. However, Otto Schimmelpenninck van der Oije (bassist) was absent for this tour. 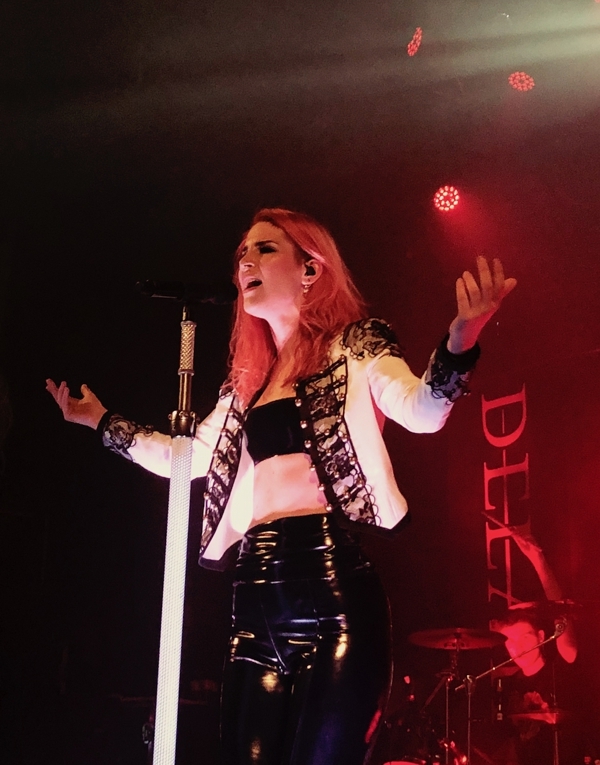 Delain toured North America last year in co-headline jaunt with Hammerfall and Latin America with Tarja and Amaranthe earlier this year, so they have now become pretty famous over there and I noticed that as they were warmly welcomed in Montréal on this night. They played a pretty usual set for anyone who know them, mostly covering their last album 'Moonbathers' (including 'Hands Of Gold', 'Suckerpunch', 'Danse Macabre' (with the new live intro I love so much), 'The Hurricane', 'Fire With Fire') and classics such as 'Mother Machine', 'Don't Let Go' and the hit 'We Are The Others'. 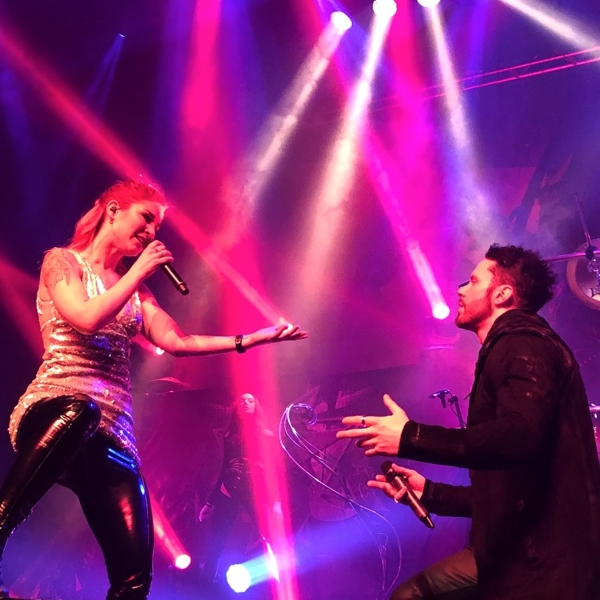 With a lot of energy, a very well-organized set and complete professionalism, Delain are now playing a big role in the field of Symphonic Metal. They will release a new EP at the end of this year, celebrating that with two shows in the Netherlands and Germany, before releasing the new album that is in the process of being written and recorded. Kamelot played a sixteen song set-list, with only a couple from their latest album 'The Shadow Theory'. 'Haven' and the previous albums were very well represented too, which was very nice for me as it was the first time for me seeing them perform live. They opened the set with the very powerful 'Phantom Divine' as they proceeded to let us discover the superb stage setup; microphones, drum set and backdrops, this band doesn't joke with the visuals. It is important to note that Lauren Hart (Once Human) was Kamelot's guest female vocalist on this tour; she assured everyone with both a few clear vocals and mostly the grunts, and she was excellent. 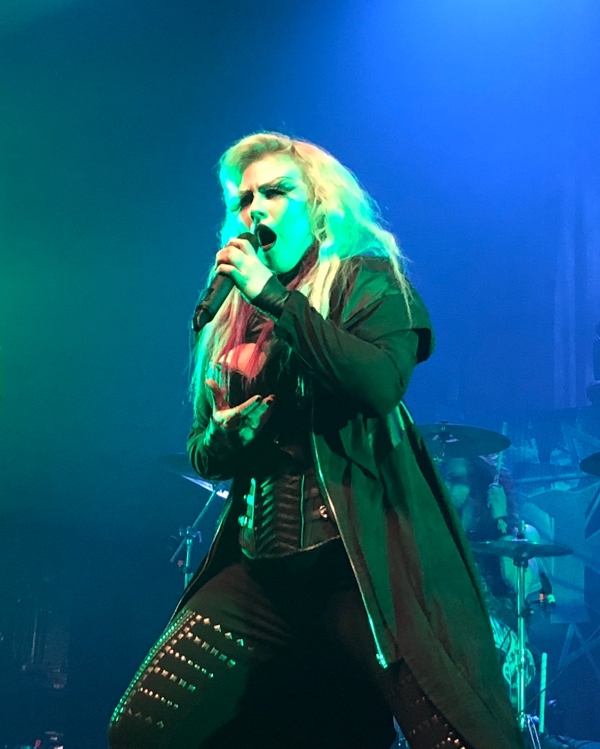 Her vocal technique is powerful, intense and reminded obviously of Alissa White Gluz. I also happened to know her from her band Once Human and I definitely appreciated the chance to see her perform live with Kamelot. Front-man Tommy Karevik is a man with a great voice and lots of charisma, and he suits the role of Kamelot vocalist perfectly well. His voice was clear and well mastered, while Thomas Youngblood (guitar) and Sean Tibbetts (bass) were full of energy as well. The set-list was powerful and reflected how talented Kamelot are at playing Power Metal; 'When The Lights Are Down', 'RavenLight', 'March Of Mephisto', 'Forever', 'Liar Liar (Wasteland Monarchy)' and 'Sacrimony (Angel Of Afterlife)', the latter saw Charlotte Wessels (Delain) join the band on stage to perform the parts normally sang by Elize Ryd (Amaranthe) – it remained in my head for weeks after the show! Kamelot delivered ninety minutes of intense music and made this evening even more unforgettable than I could have expected. I could appreciate both how professional and how talented they are, be that on the studio versions or live on stage. This mix of new and old songs was a good idea, even if some people might have been disappointed that the latest release wasn't covered that much. I am already waiting for them to play at the end of 2018 in Europe/UK (supported by Leaves' Eyes). This night was one to be remembered for the quality of the music and the variety of genres played by the three bands. Most of them came out at the end of the gig to say hello, share a few words and drink a beer. That made the end of this evening even better. That was worth the price of the trip alone and it is not every day that the European guy that I am has the chance to see such amazing bands in Canada – I'm very glad I attended tonight.